The Ely Stage Stop & Country Museum presents the next Living History event on Saturday, October 24. This will be the final Living History Day for this year. November and December events have been suspended due to the approaching holiday season. The October event will welcome Phil Smoley, Lake County Historical Society Board Member and Civil War aficionado. Smoley will be available to the public in the Ely main house starting at noon to talk about how the Civil War helped to save Clear Lake. He will be available until 2 p.m. to visit with guests and answer questions. The Lake County Historical Society’s Ely Stage Stop & Country Museum is located at 9921 State Hwy 281 (Soda Bay Road) in Kelseyville, near Clearlake Riviera, just north of Hwy 29-Kit’s Corner. Current hours of operation are 11 a.m. to 3 p.m. each Saturday and Sunday. Living History events are held on the fourth Saturday of each month from noon until 2 p.m. Fiddlers’ Jams occur the first Sunday of every month, again, from noon until 2 p.m.
Visit www.elystagestop.com or www.lakecountyhistory.org, check out the stage stop on Facebook at www.facebook.com/elystagestop, or call the museum at 707-533-9990. 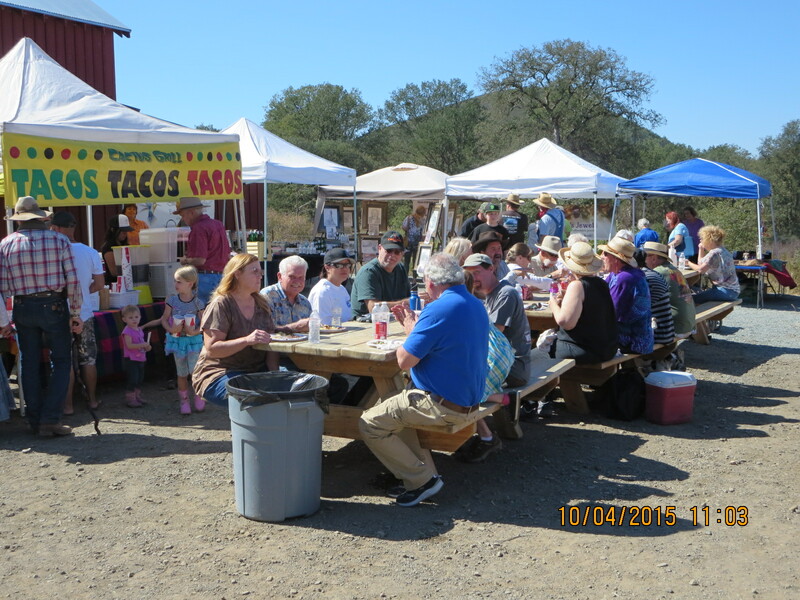 A local Craft Fair Marketplace was held Sunday October 4, 2015, at the Ely Stage Stop & Country Museum, in conjunction with the monthly California Old Time Fiddlers’ Jam Session. Nineteen local craft folks sold their wares to several hundred attendees. Donations made during the Fiddlers’ Jams typically benefit both the Ely Stage Stop and the Old Time Fiddlers Association, District 10. This month all donations made during the jam will benefit Valley Fire victims through the Lake County Wildfire Relief Fund created by North Coast Opportunities (NCO) and Mendo Lake Credit Union (MLCU). The local craft vendor fees and all donations, including those raised during raffle and silent auction offerings, are being donated to the Wildfire Relief Fund. The District 10 Fiddler’s Association also made a special donation of $500 as several musicians lost their homes during the Valley Fire. The total amount to be donated as a result of the Fiddlers’ Jam and the Marketplace is $2,895. The Lake County Historical Society wishes to show their appreciation to all of the vendors who rented space in the Marketplace, to the Old Time Fiddlers Association, District 10, for their music and their generous donation, and to the Ely docents and volunteers who gave so generously of their time and energy to present the event. Most of all the Historical Society sincerely appreciates all of the attendees who donated so generously during the event. The Lake County Historical Society’s Ely Stage Stop & Country Museum is located at 9921 Hwy 281 (Soda Bay Road), Kelseyville, California. For more information, check outwww.elystagestop.com, www.lakecountyhistory.org, www.facebook.com/elystagestop, or call 707.533.9990, during museum hours, Saturdays and Sundays from 11 a.m. to 3 p.m.
Folks enjoying the October Ely Fiddlers’ Jam and Marketplace. All donations that day went to the Lake County Wildfire Relief Fund to benefit the Valley Fire Victims. Photo by Steve Hendricks.